We talk a lot about sending SMS messages from web applications, but what about sending SMS messages from a React application? There's a bit more to it than just the server-side version, but it won't take us long. 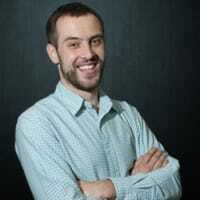 Why shouldn't I use the REST API from the client-side? To avoid this we will create a back end application that implements the Twilio REST API, wraps up your credentials and sends SMS messages for you. Then you can call your back end from your React application and send SMS messages without distributing your credentials to the internet. To get started, download or clone the react-express-starter application that I built in my last blog post. Change into the directory and install the dependencies. You can now test the project is working by running npm run dev. The application will load in your browser at localhost:3000. 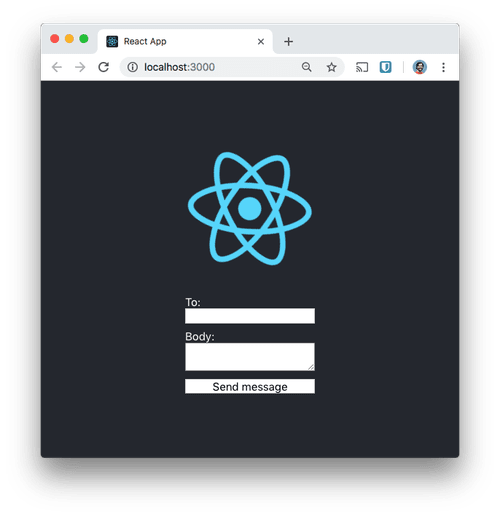 This starter application is set up to have both a React application and an Express application in the same project that you can run concurrently. If you want to find out how this works, check out this blog post. As discussed, we need to make the Twilio API calls from the server. We'll add an endpoint to the Express server that can be called from our React application. Start by installing the Twilio Node.js module. Note: for the purposes of this application I'm saving the server dependencies as development dependencies to separate them from the client-side dependencies. This will set your credentials in the environment. Now, open server/index.js so that we can get started with the code necessary for sending the message. Under the other module requires at the top of the file, require and initialise the Twilio library with the credentials from the environment. We're going to respond with JSON too, so set the Content-Type header to application/json. We'll then use the Twilio client we initialised earlier to create a message. We'll use our Twilio number as the from number and get the to number and body of the message from the incoming request body. This returns a Promise that will fulfill when the API request succeeds or reject if it fails. In either event we will return a JSON response to tell the client-side whether the request was a success or not. That's all we need on the server, let's get started on the React portion. We're going to create a form that a user can fill in with a phone number and message. When the form is submitted it will send the details to our server endpoint and send the message as an SMS to the number. Start your application with npm run dev and you'll see the form on the page. The form doesn't do anything yet, so let's fix that. We'll need a method that can handle changes in the form fields and update the state. We could create two methods, one for the input and one for the textarea, but since the names of the form elements and items in the state match up we can build one method to cover both. Note here that we use ES2015's computed property names to set the right property in the state and the spread operator to fill in the rest of the state. Reload the app and you'll be able to update the form fields. If you have the React dev tools for your browser, you'll be able to see the state updating too. Now we need to handle the form submission. Build another function, onSubmit, that starts by updating the submitting state property to true. Then use the fetch API to make the request to the server. If the response is successful then clear the form and set submitting to false. If the response is not a success, set submitting to false but set error to true. Now, in the JSX we add the onSubmit method as the submit handler on the form. We also set the form's class to "error" if we receive an error from the request. And while the form is submitting we set the button's disabled property. This is all we need, so refresh the app again and enter your mobile number and a message to send. Submit the form and if the details are correct then your message will be sent, if not, the form will show that the state is in error. Sending SMS messages from a web app is cool. Sending SMS messages from your React app without exposing your credentials is even cooler 😎. You can check out all the code from this example application in the GitHub repo. Now that you have the basis of a React app that can send SMS messages you could make some improvements. First would likely be better validation and error messages. 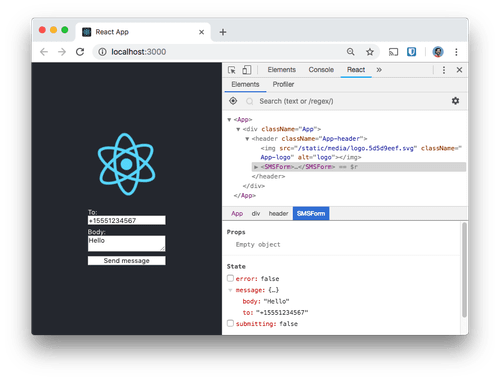 With a similar design you could add phone number lookups, generate phone calls or implement two factor authentication right from your React app too. I’d love to hear about the app you’re building with React. Drop me a comment below, hit me up on Twitter at @philnash or send an email my way at philnash@twilio.com. Proxy error: Could not proxy request /api/messages from localhost:3000 to localhost:3001/. See nodejs.org/api/errors.html#errors_... for more information (ECONNREFUSED). Oh, that's interesting. Are you running the server with npm run dev? Are there any other errors in the terminal? Have you filled in the .env file with your credentials? And ensure you're not using test credentials? What's the code you have for the /api/messages endpoint right now? Does Twilio support the live broadcast feature? as I am developing an application like BigOlive or Atompark. so before making the purchase, I need to know and view good respond. I guess you're asking about Twilio Video? If so, it's not built for broadcasting video streams to many watchers. The primary use for it is for 1 on 1 and group conversations over video, with a maximum room size of 50 people. Twilio is not free of charge, no. There is a trial account that you can use to test with, but if you want to run with Twilio in production you will need to pay for it. You only pay for what you use though, check out the pricing here.